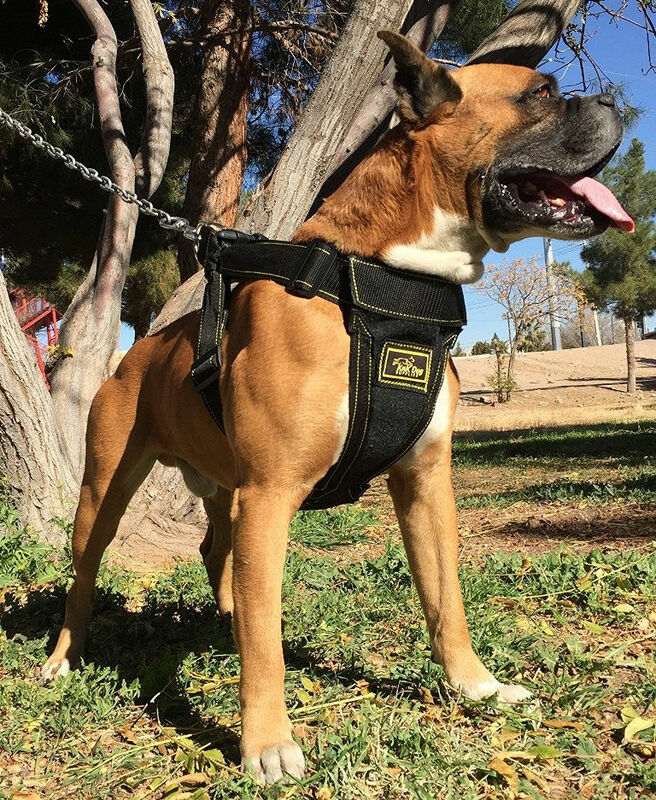 Autor knkdogsuppliesPublicado el abril 8, 2018 octubre 14, 2018 2 comentarios en How to choose your Dog Harness Vest? Are you struggling with Destructive Chewing Dog? or dog fights? Is your dog destroying everything in your house? Many Dogs tends to destroy things or fight because they are what the experts call High Energy Dogs, and the easiest way to deal with this kind of problems is the exercise, challenges and discipline. Keep in mind that all dogs comes from wolf and these ones use to walk very long distances looking for food, so experts recommend challenging your dog to keep him balanced. There are many ways to exercise your dog, there are Dog toys, Dog Harness, Dog Leashes, etc. just you need to find out the perfect way to challenge your dog to dry out all that accumulated energy. 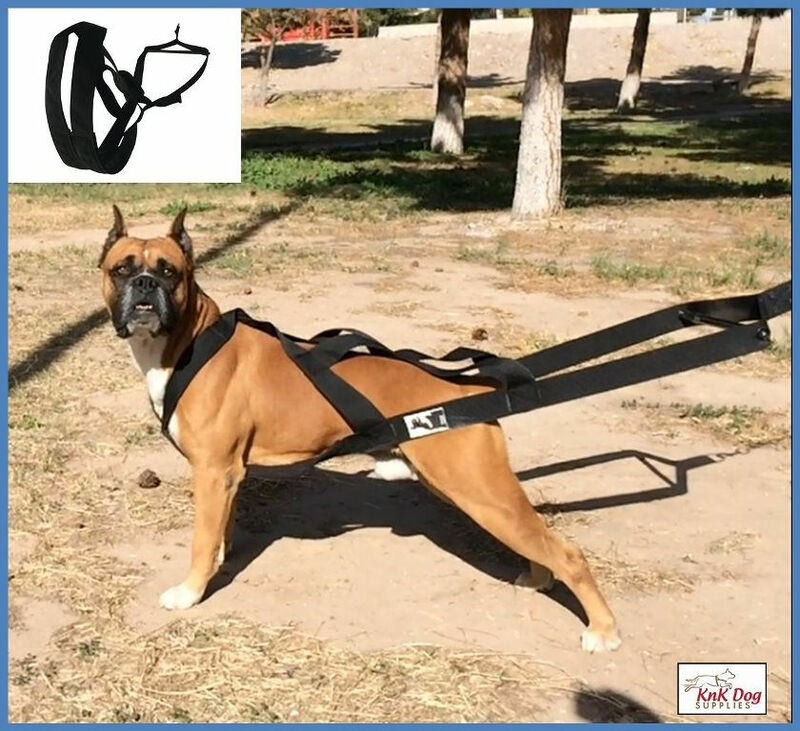 KnK Dog Supplies has a couple alternatives not only to exercise your dog but to really challenge him, check our Dog Weight Pulling Harness, it can be used by pet dogs or competition dogs, any dog can use it! 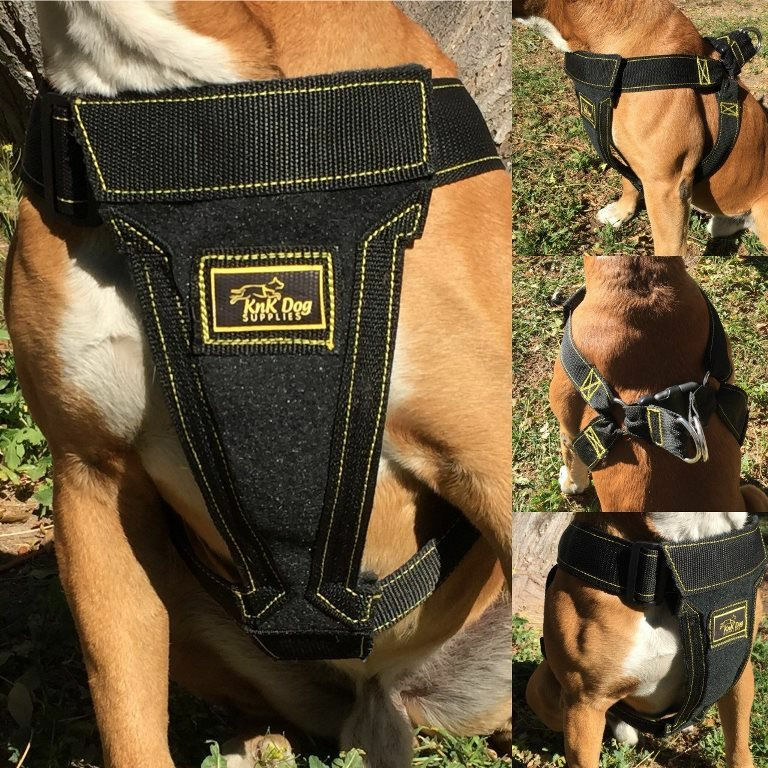 Stop by our Shop section and check our Dog Weight Pulling Harness! If your dog is a natural puller take advantage of that and start right away! No more excuses, say good bye to your Destructive Chewing Dog? and welcome your new balance dog!, Develop you new K-9! Stop by the shop section and check the products we have for you! Safety is first – If you are a beginner and if you are not in complete control over your dog by using a Dog Collar some neck injuries may happen, it is so common that high energy dogs pull their owners or fight the dog leash during walks, for this reason it is recommended to use a Sturdy Dog Harness, in this way instead having dog’s weight concentrated in the trachea all the dog’s weight will be spread in the chest area. 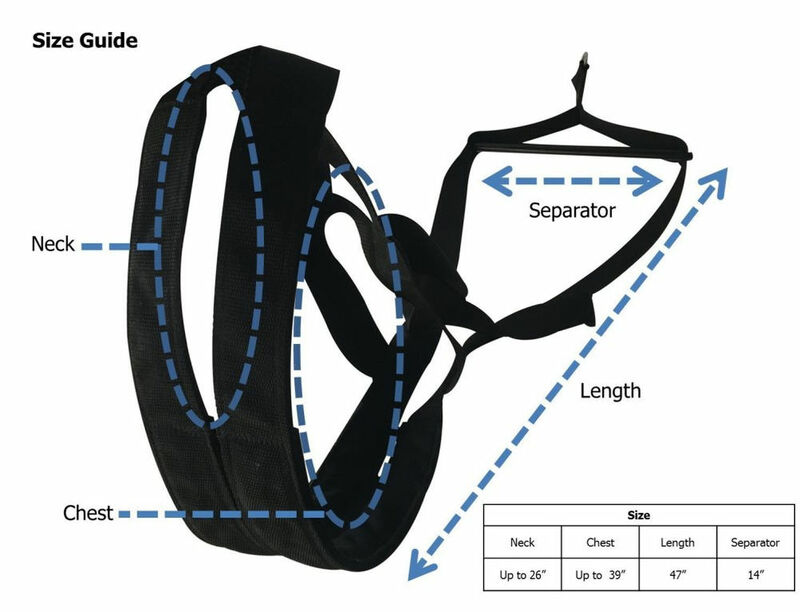 There are thousands of Dog Harnesses available but before getting one we recommend that you consider some safety aspects as: make sure it is a Padded Dog Harness and make sure it is an Adjustable Dog Harness, you will need to measure your Dog and compare those measurements against manufacturer specs in order to assure that Dog Harness will fit your dog, also check as many pictures as you can so you will have a better idea in how your new Dog Harness will fit on your Dog, remember it is extremely important that design of the Dog Harnees disperses the dog’s weight over the chest area and not only on the neck or stomach area. 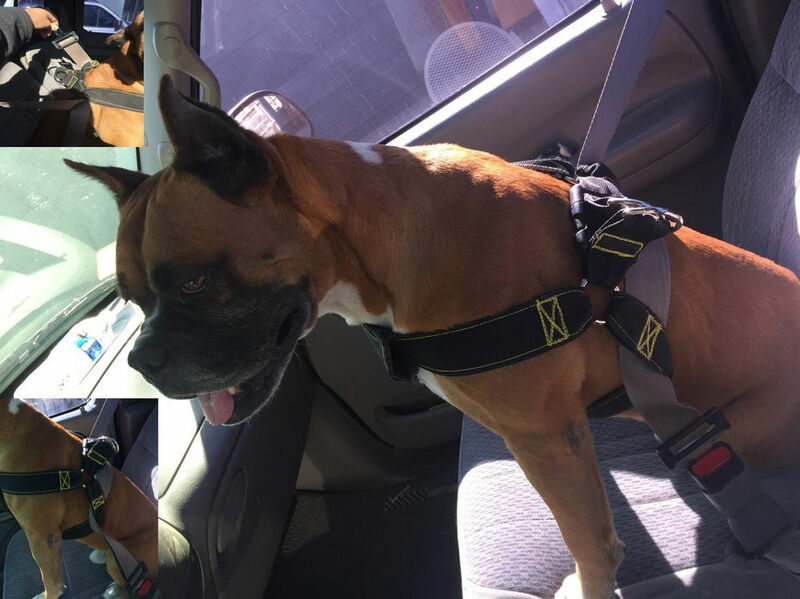 Knk Dog Supplies is offering a great Sturdy Dog Harness, this one is a adjustable dog harness for medium size dogs to large dogs, it is durable, easy to harness up and can be also used as car Dog Seat Belt Harness. 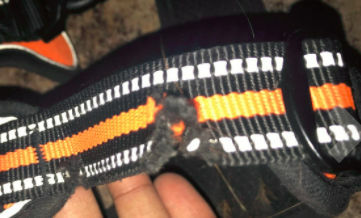 Main material is webbing that resists up to 1600 lbs, any Dog Leash can be attached to the Harness back and its padded chest area will keep your dog comfortable all the time. Its design separates your dog’s weight over the chest area, its strong heavy-duty materials as metal rings makes this dog harness resistant and cool, besides its cool colors combination, yellow and black, will make your dog look amazing!! So next time you need to decide between a dog collar or sturdy dog harness? we are sure now you have more information to pick the right one! let us know what you think! Follow us in Facebook! and Instagram! Autor knkdogsuppliesPublicado el abril 8, 2018 agosto 7, 2018 Deja un comentario en Dog Collar or Sturdy Dog Harness? Keep your Dog amused and in Great Shape by draining accumulated energy!, This Item will make your dog capable to pull a Dog Pulling cart, or your dog can also pull you while you a ridding a bicycle or skating! Check this Weight Pulling Dog Harness! Great as Pitbull pulling harness but any breed can use this Dog Weight Pulling Harness!! SUPERIOR PERFORMANCE! Your dog will be your new bodyguard because he will develop muscle and strength; juts imagine your new protection for you and your family! SAFE, your pet will be comfortable all the time because this harness is padded in the chest area, so don’t worry and start training! Start now with your Weight Pulling Dog Harness and let us know your results! KnK Dog Supplies | New Dog Vest Harness, this Dog Harness is padded and adjustable, great for any kind of dog breed, from Medium size dogs to Large size dogs, it can be also used as car dog seat belt, check all the amazing features of this cool Dog Harness!! Your search has finished ✔ This Dog harness is constructed with heavy Duty materials, it’s belt is 2” and breaking tensile point is 1600 lbs! Walking, Running, Pulling or Tracking? 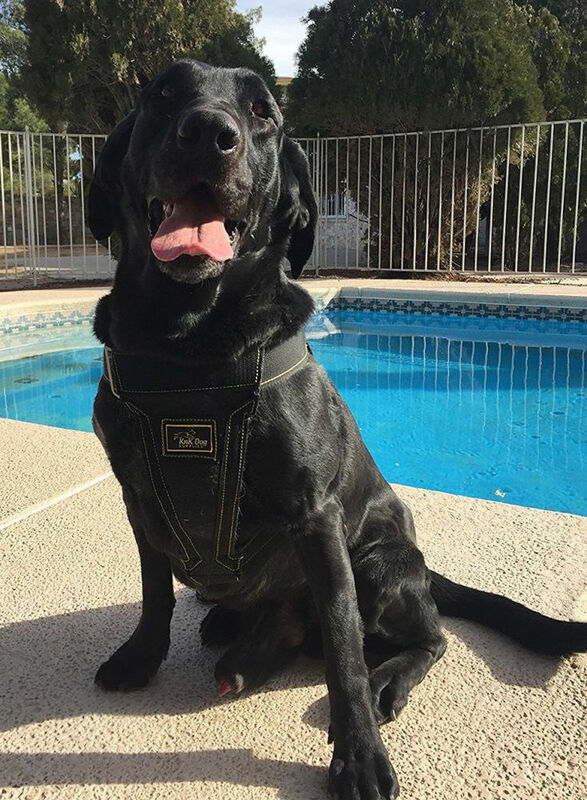 ✔ This harness is also suitable for outdoor allows your dog to perform any activity without shocking feeling; harness has an extremely durable construction that makes this dog harness ideal for your low energy dog or high energy dog! 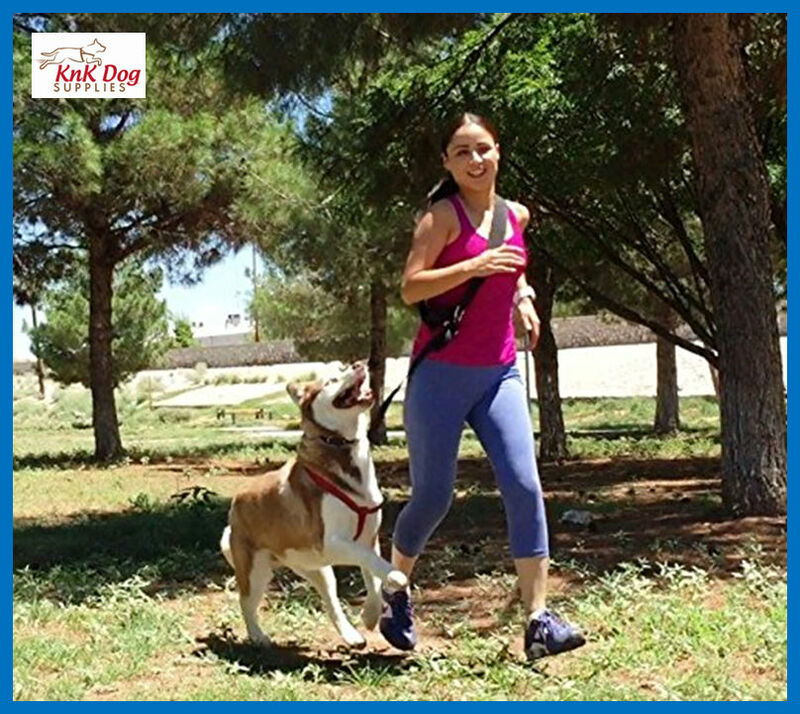 Dog Harness: ✔Great item to walk, run, train, get connection and provide hours of fun with your friend because harness design allows to hook up any pet leash, extremely easy to harness up through its quick buckle. 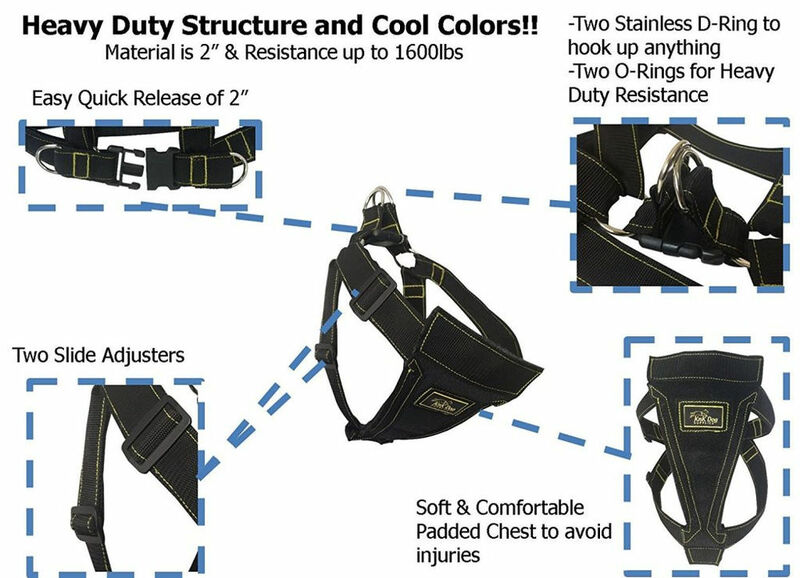 Dimensions: ✔Harness will fit on any dog of these dimensions 24” to 39” for Chest and 24” to 39” for Neck, length of the harness is 39” and Padded chest area is 14”, this padded chest provides comfort during the usage and avoid neck injuries. High Quality Materials: ✔Heavy duty 1600 lbs tensile strength, 2-Inch-wide, Thickness: Approximately 0.067″ or 1.71mm, melting point of 330 degrees Fahrenheit, UV, Rot, Mildew and Moisture Resistant, Padded on the chest area for Safety and Comfort, Heavy duty metal D-rings and O-Rings. Bad Behavior? ✔This harness can help if you have a high energy dog! Because you can exercise your pet and control bad behavior caused by accumulated energy, resulting on a healthy, happy and invaluable pet. Think on the fun and training and order your harness now!! 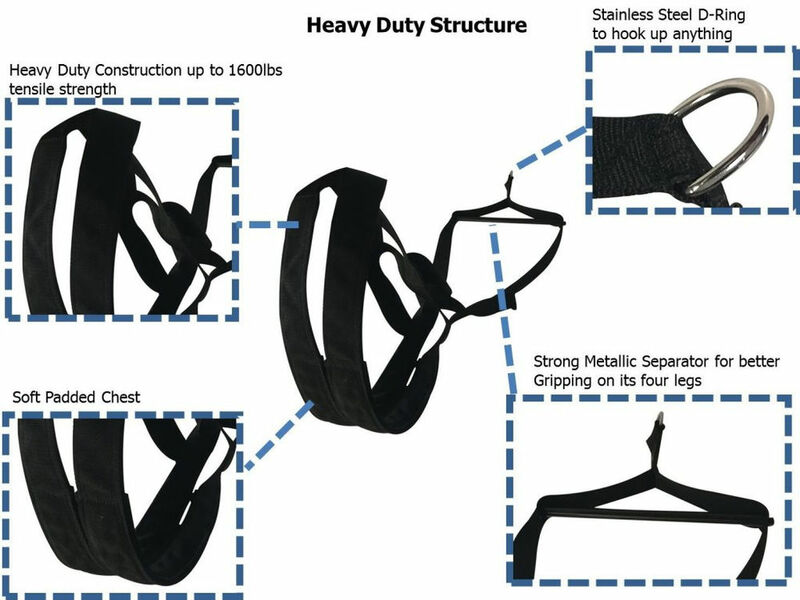 This harness can be used for a K-9 since is considered a Heavy Duty Dog Harness!! Questions or comments? let us know in our comments section!